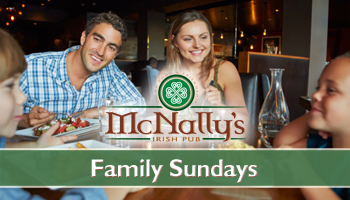 Music EVERY Sunday at McNally’s all Summer! Bring the kids and join us every Sunday when we feature our special kids menu! McNally’s Family Day: Bring the kids and join us every Sunday when we feature our special kids menu, sure to tantalize their tastebuds! March 17th is one of our biggest celebrations at McNally's! We hope you join us for some Irish drinks, food, and fun. As this holiday draws near, check back for an updated event schedule.